Bus service questions should be directed to shuttle@bloomu.edu or 570-389-4536. The Campus and Downtown Shuttle schedule has not changed. All posted hours are in effect. The Downtown loop and Honeysuckle routes will be in effect for all regularly scheduled times. Because of a temporary shortage of Shuttle drivers, there may be times this week were only one bus is running when there are normally two. Transportation and shuttle services are part of Facilities Management. The department has ten full-time and five part-time bus operators. All have PA Commercial Driver Licenses. One full-time mechanic and a foreman support eighty-three licensed vehicles and all the equipment in the transportation department. 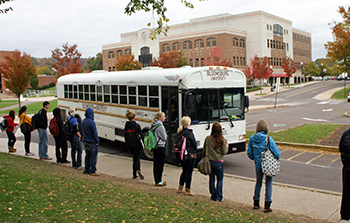 Fifteen shuttle operators transport students from lower to upper campus, downtown and Honeysuckle Apartments. Transportation has a fleet of two 15-passenger vans, one 25-passenger bus, one 24-passenger bus, one ADA van, and fifteen 44-passenger buses, for daily dispatch. Please be courteous and polite to the driver and fellow riders. Always comply with the shuttle driver's request. Their primary responsibility is your safety. Shuttles are often crowded. Please make room on your seat for other passengers. You are not permitted to save seats for others who are not on the shuttle at that moment. Do not bring large packages and/or bags on the shuttle that need storage on a seat designated for another rider or need to be stored in the isle. Always wait for your turn to board the shuttle. Never push ahead of others waiting to gain access to the shuttle. Please do not ask the driver to stop at any location other than designated shuttle stops. Requests for vehicles should be made directly to the transportation office at 570-389-4536 or fax to 570-389-3070. A Travel Approval Form must be completed and sent to the transportation office. Vehicles are dispatched from and can be picked up at the Buckingham Maintenance Center.